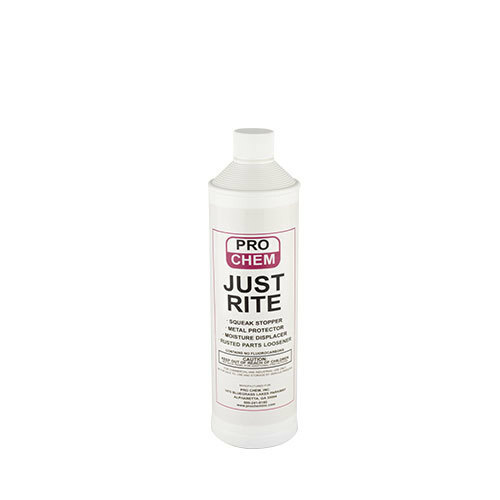 JUST RITE | Pro Chem, Inc.
JUST RITE is a nonaerosol penetrant lubricant that works like an aerosol and does not harm most plastics. Its unique formulation cleans, stops squeaks, protects metal, loosens rusted parts and displaces moisture. The product quickly penetrates to free rusted or frozen parts while leaving a protective coating to protect against rust and corrosion. This product is intended for use as a lubricant with no food contact in areas of official establishments operating under the Federal meat, poultry, shell egg grading and egg products inspection programs where there is no possibility of food contact in food processing and food handling establishments. Spray area to be treated. Let soak for a few minutes then wipe. For best rust protection do not wipe off. To remove even the most stubborn frozen bolts, spray JUST RITE on affected area then tap bolt lightly, allowing product to remain a few minutes until bolt is loosened. Note: Avoid contact with walking surfaces. It may leave them slippery.